NFPA offers a wealth of free resources to help you educate your communities and families about the importance of working smoke alarms. A smoke alarm installation program in your community can make a measurable difference in reducing deaths and injuries from fire. The updated “Planning and Implementing a Successful Smoke Alarm Installation Program” (PDF, 1 MB) is a comprehensive guide including everything you’ll need to get started, from tips on how to select volunteers, to pointers on soliciting donations and publicizing your program. 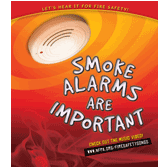 NFPA's free online smoke alarm awareness campaign toolkit includes hand-outs for families, talking points, public service announcements, fill-in-the-blank news releases, and much more. 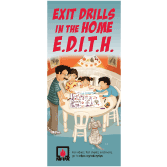 Sparky's Birthday Surprise: Kids learn what to do if the smoke alarm sounds, how to exit the house safely, and how to choose an outside meeting place. Calendar tear-sheet: Remind your family to test their smoke alarms. Use our free infographics on your web site, e-newsletters, or in your local newspapers to help spread your important smoke alarm messages. Sergeant Alarm says "Test Your Smoke Alarms!"